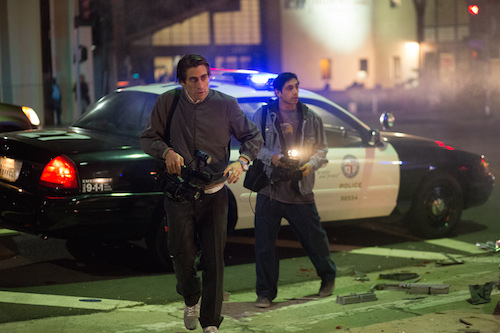 Synopsis: Nightcrawler is a pulse-pounding thriller set in the nocturnal underbelly of contemporary Los Angeles. Nightcrawler stars Jake Gyllenhaal (Donnie Darko, End of Watch) as Louis Bloom, a two-bit thief who is trying to find his place in the world. Late one night, Lou stumbles across a traffic accident and notices a pair of cameramen filming the scene. After picking their brains about what they do, Lou buys a camcorder and a police scanner and becomes a “stringer” – a freelance news photographer. Not quite understanding the business, Lou routinely gets scooped on stories, until one night he happens to get to the scene of a carjacking before anyone else. He takes the footage to Nina Romina (Rene Russo from Thor), a news director for a local station who recognizes his eye for the sensational and tells Lou to give her the first crack at anything he shoots from now on. Lou continues to bring the footage to Nina, and she continues to buy it, so Lou is able to expand his business by purchasing a better camera, getting a faster car, and taking on a street kid named Rick (Closed Circuit‘s Riz Ahmed) as an assistant. As the stories get bigger, so do the paychecks, and eventually, Lou blurs the line between capturing the crime scenes and creating them. 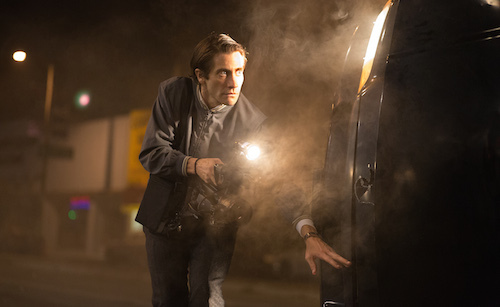 The screenplay for Nightcrawler was written by Dan Gilroy, who also wrote Real Steel and The Bourne Legacy. The film is his directorial debut, and if it’s any indication of his storytelling talents, he’s got a bright future ahead of him. The world that Gilroy creates is dark and disturbing, yet the story has a sort of wide-eyed innocence when told through Lou’s eyes. Gilroy offers a glimpse into a subculture that many don’t even know exists, and it’s not a pretty one. However, Lou’s approach to his new career is somewhat naive, with the character having to learn everything as he progresses along his newly chosen path. It’s an intriguing dichotomy, and Nightcrawler shows both sides of the coin well. Nightcrawler is an interesting mix of a movie; the visuals are stunningly beautiful, but the subject matter is ugly. 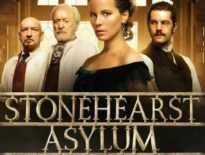 The film is creepy and unsettling, but it’s still got a tongue-in-cheek vibe, presenting its very real themes and motifs in a very surreal way. The vibe is along the same lines as that of One Hour Photo; it’s not meant to be a horror film, but it’s pretty horrific. Nightcrawler is the roller coaster ride that the viewer can’t get off of or the car accident the viewer looks at when they know that they shouldn’t. They can’t help themselves as there’s a pretty gloss to the ugliness. 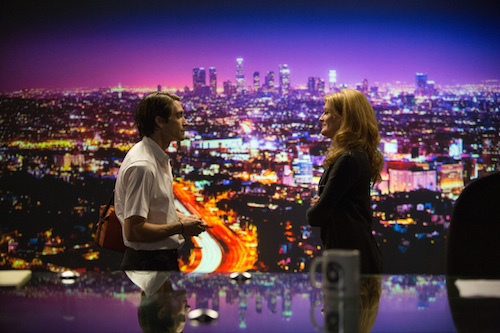 There is a strong message in Nightcrawler about information as entertainment. Nina, the news director, actually lives by the credo “if it bleeds, it leads.” She recognizes the fact that her audience only cares about bad news, so that’s what she gives them. Nina gives Lou specific instructions to bring her footage of violent crime scenes that have crept into the suburbs so that she can instill a sense of paranoia into her audience, a paranoia that will keep them glued to her news broadcast for more sensational stories to make them paranoid. It’s a cycle that real-life news stations seem to follow as well; despite crime being at a statistical low, today’s newscasts cover the same type of stories that Nina’s fictional ones cover. The whole thing makes audiences wonder how much of Nightcrawler is actually fiction, and how much of it is based in reality. 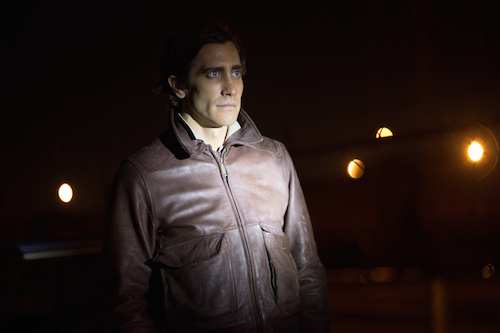 Although he is surrounded by a capable supporting cast that includes Rene Russo, Riz Ahmed, and Bill Paxton (Edge of Tomorrow), Nightcrawler is Jake Gyllenhaal’s movie. And he owns it. Gyllenhaal’s recent performances in films like Prisoners and Enemy have been stellar, but Nightcrawler‘s is the first time that he leaves his own persona behind and dives completely into the role; Gyllenhaal is not acting like Lou, he becomes Lou. He quietly captures the subtle combination of confidence and creepiness that is present in a person who applies himself so intensely to a job that is as morbid as television news stringing. Lou is a socially retarded loner, and Gyllenhaal’s commitment to the awkwardness of the role is unsettling. He is the hero of the film, and the audience is both charmed and repulsed by him. Gyllenhaal walks the line perfectly, and his performance in Nightcrawler is one of the greatest of his career so far. The city of Los Angeles is almost its own character in Nightcrawler, and director of photography Robert Elswit (who has shot most of Paul Thomas Anderson’s films, including Boogie Nights, Magnolia, and There Will Be Blood) treats it as such. The film was shot on location on the streets of L.A. in the middle of the night, and Elswit uses plenty of wide angle lenses to show off the scenery. The darkness of night is split by the bright halogen street lamps and the colored neon signs, creating a surrealistic atmosphere. Los Angeles is a big city, and Nightcrawler makes use of every type of locale, from the Valley to Downtown, from the desert to the city. With his photography in Nightcrawler, Elswit shows a Los Angeles that is breathtakingly beautiful – as long as you’re not in the middle of it. The other unsung character in Nightcrawler is Lou’s camera, and Elswit takes great care in representing that as well. There are sections of the film where the audience sees the story through Lou’s lens, and the narrative becomes a first-person shooter in these sequences. Elswit accomplishes this without the usual motion sickness that accompanies found footage movies; instead, he just puts the viewer directly into Lou’s head by showing what he sees. There are even a few shots where the camera captures Lou capturing his shot, and Elswit keeps his focus on Lou’s viewfinder as opposed to the world around it; all that’s important to Lou is what his camera sees, and that’s all that Elswit’s photography shows the audience. It’s brilliant. The cinematography of Robert Elswit puts the viewer in the middle of the story, whether it’s on the streets of L.A. or inside Lou’s head.